AFTERSHOCK: NWA Mid South Wrestling Goes Down Under THIS SATURDAY – September 12! 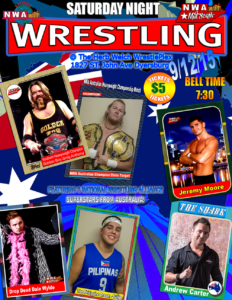 Home / NWA MIDSOUTH / AFTERSHOCK: NWA Mid South Wrestling Goes Down Under THIS SATURDAY – September 12! The top Pro Wrestling stars from NWA All Action Wrestling in Australia INVADE The Herb Welch WrestlePlex this Saturday night, September 12th. They have been signed to compete against the top stars from NWA Mid South. We have a listing of the announced matches below. Check it out! And don’t forget to share this article with your friends on Facebook and Twitter! Chris Target will defend the top prize in the “Land Down Under” against a man that is not only the NWA Southern Heavyweight Champion, but, also a member of the most dominant faction in the ‘Sport of Kings” today – The Empire. That man is none other than “The Golden Boy” Greg Anthony himself. Anthony will no doubt look to add yet another title to his and the Empire’s treasure trove as they already hold four of the most storied titles in wrestling history. However, Christ Target is no easy win and should not be taken lightly by Greg Anthony or anyone else for that matter. We are certain that this match will have fireworks to say the least! One of the top stars of not only NWA’s Australian promotion, but, also the entire National Wrestling Alliance, Andrew “The Shark” Carter has accepted the challenge of “The Epitome of Sports Entertainment” Jeremy Moore. Jeremy Moore has faced giants, ironmen, and super heroes since joining the NWA Mid South roster. He’s either beaten or outlasted all of them and will be looking to make a bigger name for himself by defeating “The Shark”. But, they don’t call Andrew Carter “The Shark” for no reason. He is a ferocious competitor inside the Squared Circle and will not hesitate to “take a bite” out of Moore! Also on the card will be a man by the name of The Philippine Dream. He is well versed in all styles of Pro Wrestling and can adapt to any situation or competitor no matter the man’s size, strength, or style. This will surely be a night of great wrestling action that will have the entiure national Wrestling Alliance buzzing for weeks! We hope you are able to make it out to The Herb Welch WrestlePlex, located at 1827 St. John Ave in Dyersburg, TN. Bell time is 7:30pm this Saturday night and tickets are only $5! Members of the US Military and Military Veterans enjoy FREE admission by presenting their ID Card at the door. Don’t forget to “Like” NWA Mid South Wrestling on Facebook – www.facebook.com/nwamidsouth! Or you can follow us on Twitter at @NWA_MidSouth!